The OmniSuite team today released a major update of OmniSuite, the player and authoring-environment for spherical displays. The highlight of this release is a completely new Controller application providing a modern graphical user interface. Beside the new appearance, the usability was improved based on our experience and feedback from our users. Also we managed to simplify the use of all OmniSuite applications by reworking procedures, removing techniques and merging applications without loosing functionality. 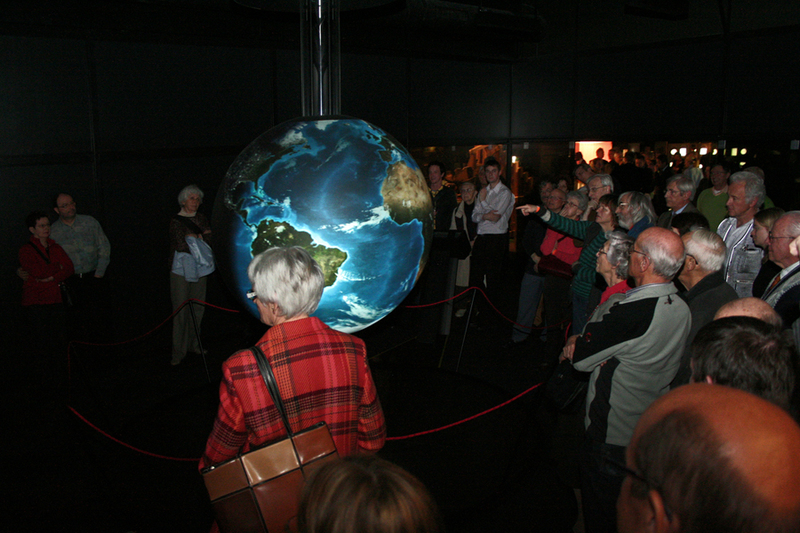 Ab November 2016: Besuchen Sie das neue Naturmuseum in St. Gallen (Schweiz) mit einem interaktiven OmniGlobe® 48 der neuesten Generation. Lassen Sie sich von spannenden Animationen beeindrucken und erleben Sie unseren Planeten in einer neuen Perspektive. more information in the Development Blog in OmniSuite's Catalog. Example of a professional interactive Touchscreen Design with our Software OmniSuite realized by Science Center Technorama (Switzerland). The Universum Bremen reopened after a major renovation and update of their exhibits. Amongst others an interactive OmniGlobe® is now part of the science center in Bremen, Germany. The new Data Globe displays the complexity of our planet and how everything is interconnected (the weather, climate zones, ocean currents, etc.). A new installation in Krško (Slovenia) is now open to the public. the economic, social and environmental dimensions of power generation. In the Catalog Application of OmniSuite (since version 4.8) you can find the new OmniSuite Category. It offers you an overview over our powerfull software package OmniSuite. Download new versions and useful resources to get you started with the development of your own stories. Enter the new Showroom and get to know our products. Take a look at the Reference list. The Max Planck Science Tunnel addresses the megatrends of the 21st century. It takes you on a journey through the major issues of basic research, from the origins of space, the idiosyncrasies of the wonder that is the brain, to the vision of sustainable energy supplies. Objects, illustrations, interviews, films and experiential media spaces of augmented reality provide an introduction to the topics, offer insights and create a network interlinking future technologies. The new Max Planck Science Tunnel occupy 800 square meters and premieres at the world's largest computer museum, the Heinz Nixdorf Museums in Germany before beginning its journey around the world. The European Commission is launching the European Space Expo to show how space and its applications provide benefits to Europe's citizens. The Expo will highlight the critical role of the European Union in space and space-based technologies. Through the investment in the flagship programmes of Galileo, EGNOS and GMES, the citizens of Europe will benefit from the many services and applications, which are expected to create global market opportunities and help to support job creation and economic growth. Presented for the first time, visitors to the Expo can see, touch and experience the wide range of innovative technologies and services that space offers them. About the origin of the universe, of earth, of life. The demonstration "Planet Earth - Cosmic Oasis" in the Technorama is about the issues that matter to mankind for millennia. The new presentation is exceptional in the sense of scientific experience: A globe of 1.5 m diameter hovering in front of a panoramic screen that represents the cosmos in the exhibition room. On the globe changes are simulated that have shaped the face of the earth over billions of years, while in the background the moderator, astrophysicist Professor Dr. Bruno Deiss of the Physical Society of Frankfurt University takes the visitor on a journey through the most important stages of development of the universe and the earth. A new Exhibition called "E-MISSION" just opened at the "HEIM Technology Museum". In an experimental way you can discover all about renewable energy. A new Webgallery from our customer Aquarium Finisterrae in Spain. One of our Globes at the World Economic Forum in Davos (Switzerland). The Globe shows different global risks like earthquakes, cyclones, global fires and a tsunami. A television contribution about the innovations at Vulcania, one of our french customers. Information about the Globe-Demonstration at Deutsches Museum in Munich (including a Demo-Video-Clip). Togheter, the "Deutsches Klimarechenzentrum" and the "Max Planck Institute for Meteorology" presented different climatemodels with the ClimateGlobe at the "Hamburger Klimawoche". An article about one of our Globes at the ETH Zurich and and its use for educational purposes. A press Information about the Orbitarium at the Swiss Technorama Science Center, one of our first customers.